The mainstream press has accused Hobby Lobby, a great and beloved American company, of hypocrisy, unchristian behavior, smuggling, stealing, and even funding terrorism. As punishment, and concluding an investigation that has been going on for six years, the US government has extracted from the company a fine of $3 million, and the company is sending to the government property it bought fair and square. What Hobby Lobby was doing could have finally saved this sacred history on behalf of the whole of humanity.What horrible things did the company do? It purchased from sketchy sources in the Middle East thousands of ancient artifacts, including extremely rare cuneiform tablets. The purpose of such purchases – the Green family that owns Hobby Lobby spent its own money – is to complete an exciting project in the nation’s capital, the building of a new museum called the Museum of the Bible that will be open to the public in November. For its efforts to save ancient historical artifacts and put them on display for educational purposes, the company has been declared guilty of trafficking war loot. And the property it bought? It is presumably going to be owned now by the US government – and maybe put in a warehouse and forgotten, like the disgraceful scene from the Raiders of the Lost Ark. And yet, it was the chaos of the Iraq War itself that brought these artifacts to the black markets to begin with. Previously, one supposes, they were claimed by Saddam Hussein as the national property of the government that the U.S. overthrew. They were pillaged by traders in the midst of the confusion that the US had not properly prepared for. This was 25 years ago, and, presumably, the artifacts have changed hands many times. Hobby Lobby deserves praise, not condemnation, for these actions. Given how valuable these items are, and how little care the US government showed them, there is a sense in which the black market deserves praise. There was no longer a regime in place to claim ownership. The treasures were not destroyed or forgotten. Rather, they were preserved in the care of new owners and traders who understood their value – far more so than the marauding occupiers who allowed a birthplace of civilization to be pillaged without a thought. Hobby Lobby – scrupulously and motivated by genuine piety – was only seeking to recover them and put them on display to increase public awareness of their value and what they represent. It is not the company’s fault that these treasures were floating around and changing hands all over the Middle East. Hobby Lobby didn’t cause the war. It didn’t steal a single thing from anyone. What the company was doing was systematically buying them from criminals, gangs, and shadowy forces with an eye toward keeping them safe and showing them to the public. 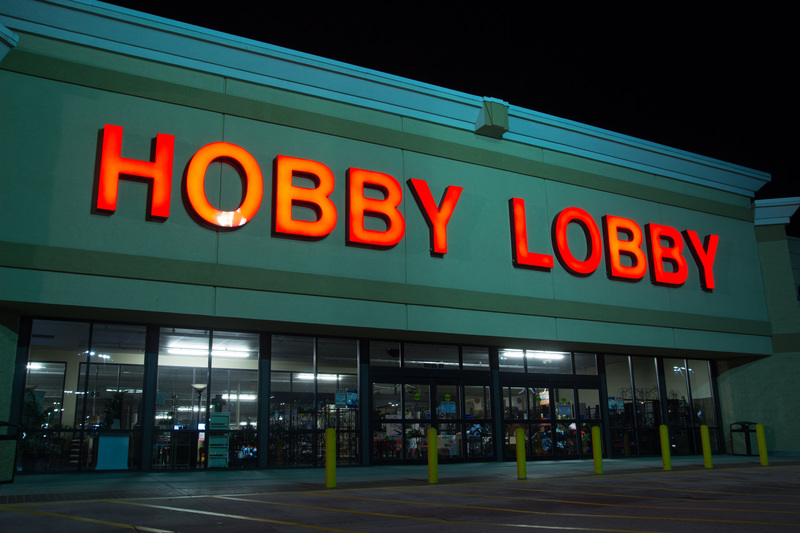 Hobby Lobby deserves praise, not condemnation, for these actions. The most preposterous claim is that what the company did was unchristian. This is a jab at the company culture, of course, which is openly evangelical and has otherwise embroiled the company in public controversy. The Supreme Court decided in favor of its claim that it should not be forced to provide medical services to its employees. It was the first time in US history that the courts said that a for-profit company enjoys certain rights to religious liberty – and the partisans of Obamacare have never forgiven the company for that reason. It’s like the whole of the social-democratic opinion cartel got on board with a plan: get Hobby Lobby! What about the claim that there was fraud involved in the shipping of items themselves? According to reports, the company acquiesced to falsified shipping records in order to disguise the contents of the packages. Hobby Lobby wasn’t stealing; it is being stolen from.This strikes me not as fraud – who is actually being defrauded here? – but rather very smart and strategic behavior. What was the company to do? Put a big stamp on the packages that says PRICELESS ARTIFACTS FROM ANTIQUITY INSIDE? The efforts to disguise the contents were consistent with the care that the company was taking with the property that it justly acquired on the market. In fact, by not insuring the contents as much as the shippers might have been willing to cover, the company was bearing the full liability that would have been associated with theft. Therefore it had every incentive to obscure the nature of the contents. No one got hurt by their doing so. The black market has done more for the cause of historical preservation than either Saddam Hussein or the occupying military forces ever did.If collectors like the Green family were unwilling to purchase unprovenanced antiquities — items that do not have a clear and clean history of discovery and purchase — the black market would dry up. As long as there are buyers, there will be sellers. It is because collectors like Hobby Lobby are willing to pay a premium and look the other way that looting continues. They dramatically expanded the market for biblical antiquities in the late 2000s. This is just crazy talk. Are we really supposed to believe that if the Greens had not put a value on ancient Mesopotamian artifacts that these items would thereby fall in value for everyone else? This is preposterous actually. And think about this: if the treasures actually fall to zero price, there would be no incentive to care for them and display them for the public. It is precisely because The Green family and so many others value them that they have been preserved. These writers are living in a fantasy world. Actually, the black market has done more for the cause of historical preservation than either Saddam Hussein or the occupying military forces ever did. There is the final matter of ownership records. These are obviously controversial for property that is, after all, thousands of years old. What to do? Hobby Lobby had the right solution: they should be owned by the highest bidder and displayed for the edification of the public. As a private enterprise, it could have experimented with using the right technology – blockchain – to create immutable records, along with the complete history. That way, there would never again be a controversy. Much the same is already being done in the art world to prevent forgeries, track ownership, and verify the authenticity of works of art. This process needs to commence with ancient artifacts too, for the sake of posterity and the future. What Hobby Lobby was doing could have finally saved this sacred history on behalf of the whole of humanity. Sadly, it will not be so, simply because some bureaucrats and petty pundits are working through their resentments of the company, fining them and dragging its reputation through the mud. Hobby Lobby wasn’t stealing; it is being stolen from. Yes, Hobby Lobby was the victim of theft on a grand scale. They should be applauded for their preservation efforts, something that no government knows much about. The Iraq government didn’t have a vested interest in these artifacts; they made no effort to preserve them while they were in country. The people who sold them? They wanted cash, not pottery. Hobby Lobby’s owners valued these more than anyone else in the chain of provenance. And look what gratitude they earn from their government: A fine for dealing with stolen property! Outrageous!